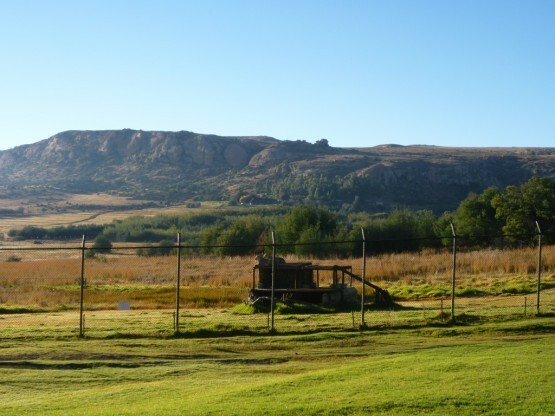 Before I arrived at LIONSROCK, in my mind I had a really clear image of what I expected: beautiful rolling hills, lions prowling gracefully around a roaring their content, and a friendly welcome from an inspiring team- and somehow, my expectations were far exceeded. The drive to LIONSROCK from Jo’burg is about three hours, through stunning countryside with plenty of animals to be sighted en route. We stopped off in the local town of Bethlehem to buy a few groceries before continuing the 20 minutes further to reach the sanctuary. Approaching the sanctuary, the road becomes dirt track and you begin a winding ascent to the area. The first sight of a lion is unbelievably exciting. As you pass the large lake, you strain to see more, and they are not hard to see. The first day of volunteering was incredibly varied, which is one of the great things about this project: no day is the same. We set off first thing to check on several of the lions, starting with Baghira, a beautiful she-lion who has to live on her own due to the conditions she was subjected to in her past life. This means that volunteers are really encouraged to develop a relationship with her, which is not a hard job at all. We visited all of the other lions too (the males are just as magnificent as I had imagined!) before helping out with a school tour of about 50 3-6 year olds. The sanctuary works closely with the community to educate kids about animal welfare, and to give the kids a tour around the sanctuary, before lots of fun games related to the animals. I was amazed about how well behaved the children were, and it was a real pleasure to be with them! The kids absolutely loved their day out, and their jaws dropped to see the lions and other big cats. They came from a local township school, andthis day out was a real joy for them. What a view from the bedroom window- look out for the lions basking in the sun! The highlights of my day however had to happen in the afternoon: feeding and enrichment. Feeding happens twice a week, to reflect feeding patterns of wild lions. Large cows are brought in from local farms and fed to the lions- they suddenly turn from majestic large cats to the hunting king of the jungle. What a privilege to see! They start growling, hunting down the meat and rushing to get the best bits. Suddenly you see why they would be terrifying in the wild! This is also a great time to learn off the staff members, who will tell you all about the sanctuary as you drive around doing the feeding. Following the feeding, we worked on enrichment. This involved giving the lions tasks to do to bring out the instincts that they have in the wild. Sarah, my co-volunteer, had filled cardboard boxes with vanilla flavouring, and the lions spent time picking them apart and sniffing them out. This keeps their minds stimulated and encourages wild behaviour. It was fantastic to see the lions in their determination to get to the yummy food and smell! As the sun was setting we strolled in the direction of the lodge, where volunteers often go for some food and drinks after a successful day outside with the lions. En route, we visited Coda the showcase tiger, a real attention seeker, and also the leopards. It was so pleasing to see them happy in a lovely environment, far from the fate that they were born into. We spent a lovely evening relaxing and eating fantastic food in the lodge restaurant- a perfect end to a fantastic day! The following day, I was awoken by the sound of lions roaring just outside my window. It was such a thrill. It sounded like they had arrived in my bedroom, whereas in fact they were still where they should be! I learned that the lion’s roar can carry about 8km – isn’t that incredible? For more information check out our volunteer with lions in South Africa web page. I would highly recommend it! Previous Post Volunteer with monkeys in South Africa: a time never to forget!